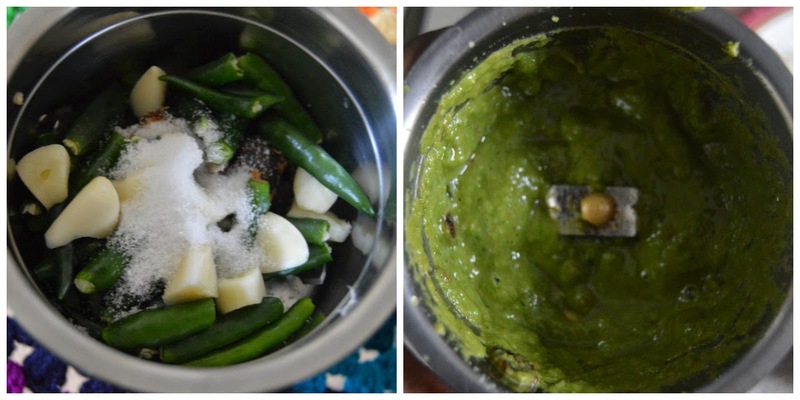 Pavi's Platter: Green Chilli Chutney ! Today's special is Green chilli Chutney.. yeah u heard it right.. its just chillis and nothing else.. hot and spicy to the core. My dad loves this so so much and asks mom to make it often and store it in fridge. He has a bit of this with everthing.. idlis, dosa, rotis or rice. My mom makes it more thicker with very less water and more oil and it looks more like a pickle and stores it for 2 - 3 weeks too. But I have tweaked it by adding garlic and a bit of water and of course it wont stay no more than 2 or 3 days. Adding onion to it reduces the heat of chillis a little. This chutney extremely hot and people who cant tolerate can add an onion too to the chutney. you can have 4 -5 idlis / dosa with just 1 spoon chutney. Grind together Green chillis, garlic, tamarind and salt to a smooth paste adding little water. If you are adding onion, then grind it along with above mentioned ingredients. Heat a small kadai/pan and add the oil. Once it is hot add the mustard and urad dal. Add the cumin seeds when the urad dal turns brown and then pour in the ground chilli mixture. Let it come to a boil and cook in medium flame for 5 - 6 minutes until the raw smell fades and oil separates on top. You can reduce the amount of water and make it like a pickle kind of consistency too. But in that case add more oil and you can store in fridge for 2 - 3 weeks. Serve the chutney with idli or dosa. Or with curd rice. Heavenly ! You can also add ghee to the chutney which not only gives a wonderful flavor but also reduces the hotness of chillis. Enjoy this spicy hot chutney and I will meet you with an another interesting recipe.